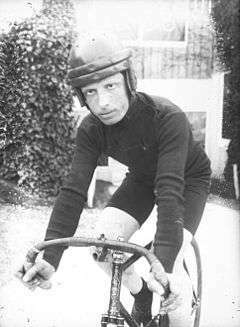 Georges Sérès (6 April 1887 – 26 June 1951) was a French professional cyclist who mainly specialized in motor-paced racing. In this discipline he won a gold, a silver and a bronze medal at the world championships in 1920, 1924 and 1925, respectively. He crashed in a 1922 race in New Bedford and had 17 fractures after being run over by a pacer. As a road cyclist he won three six-day races in Paris, in 1921, 1922 and 1924. His sons Georges and Arthur were also competitive cyclists.